LOTS of MAC and Clinique - very little Bobbi Brown....and Surprise! - a little bit of CALYX! So naturally, I LOVE to sleep in on a Saturday morning - I was EXHAUSTED from a long work week, BUT I woke up early to meet my friend and we arrived at the MAC sale by 10:15 a.m. We only waited about 30 minutes to get in. 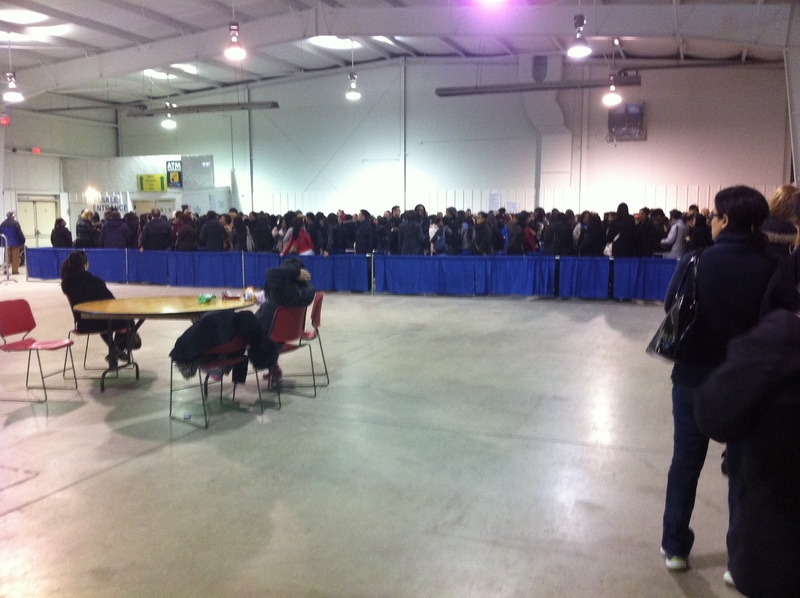 We were thrilled to see that the line was INSIDE this year! Thank you MAC for looking out for the comfort of your customers! Once inside, decisions had to be made. Stay in room 1 - or RUN to rooms 2, 3 and 4 to see what they held? We compromised and power-shopped for 5 minutes in room 1 - mostly full of Bumble & Bumble hair products, Origins skin care and MAC eyeshadows. 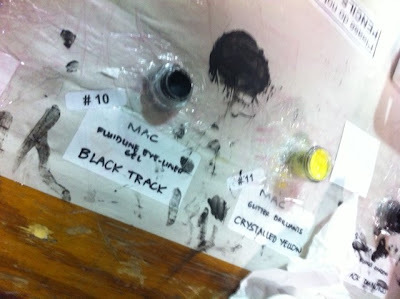 Here is a photo of the "sample" of MAC Fluidline Eye-Liner Gel in Blacktrack. TAPED down to the table. A no-frills display. Be sure to write down your product number! Customers were instructed to write down the item number of the product you wanted on tiny pieces of paper provided. You then handed the papers to staff at another table nearby. I thought I would save time (and the environment) by snapping a pic with my iPhone and showing it to the staff member. That didn't work for the first lady. She really wanted me to write my item (1 Fluidline) down on a piece of paper. Oh well - back I went, pen and paper in hand. Eventually, I got my Fluidline. And then - we RAN to rooms 2, 3 and 4. There were small signs indicating what brands were in the rooms such as: Bobbi Brown, Clinique, Estee Lauder, Origins, Ojon..... MAC was pretty much everywhere. I really wanted to pick up some Bobbi Brown makeup - but there was virtually no Bobbi Brown makeup. There was a small selection of Bobbi Brown brushes. I'm not sure if there would have been a better selection had I arrived on Friday - but I sense that this was really a big MAC sale, followed by alot of Clinique and Estee Lauder. There was a bit of Origins - mostly Ginger Souffle body lotions and bath products. One thing that pleasantly surprised me was to find CALYX shower and bath gel in one of the bins! It has been years since I've seen Calyx in Canada. They just had shower gel and body lotion. I bought the shower gel - it is called "Exhilarating Gel for Shower and Bath". I am not a morning person, and I purchased this hoping it will truly help to exhilarate my morning shower routine and WAKE me up! SO - here is what I picked up. Not a major haul - I felt like a character in a movie with an angel sitting on my left shoulder telling me NOT to spend too much, and a devil on my right shoulder tempting me to break the bank! Well, the angel reminded me how many unopened products I already have at home - so I controlled myself on this trip. Note: I also purchased some Clinique skincare for my Mom, but it is not pictured here. MAC Warehouse mini-haul -minus some Clinique skincare purchased for my Mom. I also picked up some Clinique skincare for my Mom, including a full sized Repairwear Eye Cream for only $20. Even though I did hold back from spending every last penny in my wallet, I will admit that I would have spent WAY more money had the selection of product been better. The MAC Warehouse Sale is probably your best bet to pick up limited edition compacts, and especially limited edition brush sets. For fans of Estee Lauder fragrance - you would be in paradise - this was truly the home of the Fragrance Gift Set. I was already stocked up on Estee Lauder "Beautiful", but had I wanted more, they had sets of Eau de Parfum and Body Lotion for $40. The Warehouse Sale is THE place to stock up on mascara. I LOVED the mini mascaras from Clinique in the $4 bins. I like to change up my mascara frequently, so these minis were a great find. You can also find tons of full sized MAC, Clinique and Estee Lauder mascaras. My advice: try to get there on the FIRST day of the sale, and go early! You will always find something you love, at a great price. And girls: take the advice of Girl Scouts everywhere: Be Prepared. MAC will have another Warehouse Sale in the fall - that one is perfect for Christmas shopping - that is when I would get gift sets, pretty eyeshadow compacts, and for stocking stuffers: mini mascara and lipgloss. Sounds like a good time too. I am sick with jealousy here! Don't think we have these warehouse sales in the UK. SO NOT FAIRRR! You've picked up some gorgeous bargains, enjoy using them sweets. I am searching high and low for tickets! Brows Don't Just Frame Your Face - They Rock!